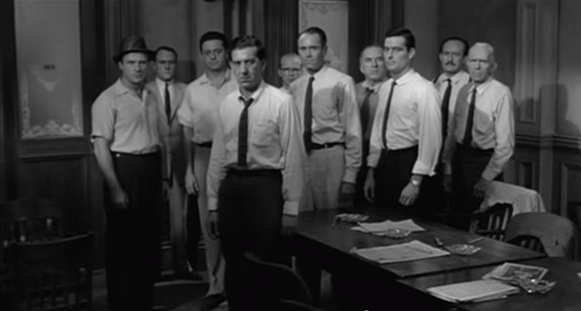 With a title like 12 Angry Men you might come away with the false idea that all the characters in this film are the same, emotionally and otherwise. That is far from the truth. The reason a film like this stands up even today is because the fellows who sit down around that table are everymen that each and every one of us can relate to in some way. Yes, they are all male and all white, but they reflect little bits of us and our own humanity. But getting down to the specifics, what is 12 Angry Men really and truly about? 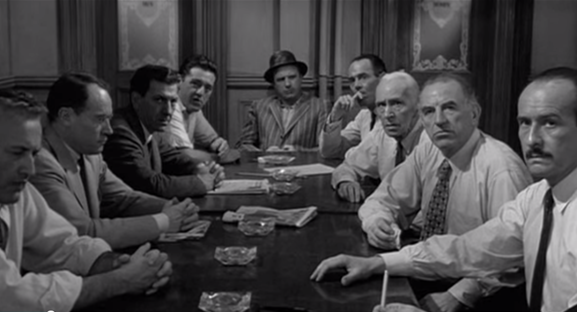 If you want to break it down, all it boils down to is 12 men gathering in a room to talk out a murder case. It sounds pretty dull and it had the potential to be so. In fact, calling it a courtroom drama is partially a misnomer because we hardly spend five minutes there before the jury is deliberating. We see the members of the jury, hear the final statement of the judge, and get a last look at the young defendant. What comes next is the beginning of the decision-making process and seeing as it looks like an open and shut case, an initial vote is called for. If everyone agrees, this boy will be sent to the electric chair for killing his father. The vote is taken and it is 11 to 1 with one man holding out. Juror Number 8 (Henry Fonda), an architect, cannot bring himself to send the boy off without talking some more and so, begrudgingly, they do talk. That is where the true heart of this film comes out, through the discussion and back and forth of the characters. They get around to evidence like the switchblade which the boy supposedly dropped. There were two witnesses: One being an old man living downstairs and the other a middle-aged woman who lived across the train tracks. Then, there is the business about the boy’s flimsy alibi about going to the movies. All are hotly debated and quarreled over. It just happens to be the hottest day of the year and about an hour in it starts pouring cats and dogs. Tempers reach their apex, feelings are hurt, and major prejudices are revealed. The beauty of this film is not simply the sentiment that the jury switches its decision. The beauty truly comes from this wonderfully colorful ensemble of actors under the direction of Sidney Lumet in a confined space. But before mentioning the direction it is important to acknowledge the players because they are the heart and soul of this story. Juror # 1: (Martin Balsam) He is the foreman who moderates, and he tries to keep the discussion civil with a relatively calm demeanor. All we know about him is that he is an assistant coach for a high school football team. Juror # 2: (John Fielder) He is one of the younger members of the jury and a quiet individual with a timid voice. He is a banker. Juror # 3 (Lee J. Cobb) The main driving force of conflict, he holds out when everyone else switches their vote. He is a businessman who also has familial issues with his son that come into play. Juror # 4 (E.G. Marshall) A rational and measured broker, he holds that the boy is guilty until some facts are laid out that make him think otherwise. Juror # 5 (Jack Klugman) A meek man and Baltimore baseball fan who also has a fiery side as well. It comes out that he grew up in the slums when he was a kid. Juror # 6 (Edward Binns) A straightforward and kindly painter who is respectful in his conduct. Juror # 7 (Jack Warner) The jokester of the group who makes his living selling Marmalade. He is looking forward to a Yankees baseball game and tries to push the proceedings forward as fast as possible. Juror # 9 (Joseph Sweeney) The eldest member of the jury and the first to side with Juror # 8. He has a fighting spirit and also some thoughtful observations on the case. Juror # 10 (Ed Begley) A loud-mouthed older man with a penchant for insults and unsavory remarks about foreigners. Juror # 11 (George Voskovec) He is a watchmaker and the foreigner in the group. However, he is obviously quite intelligent and passionate about American democracy. He takes seriously the duty that comes with being a juror. Juror # 12 (Robert Webber) Lastly comes the wisecracking man in advertising who tries to lighten up the conversation. He is the major flip flopper in the group. A mention now must be made of Sidney Lumet’s direction, because for his first film he was extremely bold to film it essentially in one room. He does it so wonderfully, however, because the confined space only heightens the drama thanks to his progressive change in camera angles. They start above eye level and slowly get lower as the drama increases. He is very rarely stagnant either, having the camera on the move or cutting to different characters. A great example of this is the tracking shot as the jurors enter the room. We are introduced to almost every character in such a fluid, natural way that sets up the story nicely. There is so much else that could be said about Fonda’s performance and individual actors who I admire, but I will leave this discussion by saying that this is one of the greatest ensembles I have ever seen brought together. The intensity they created makes me want to get up right now and serve on a jury. Too bad I already served my jury duty this year! This entry was posted in 1950s, Crime, Drama and tagged Courtroom, Ed Begley, Edward Binns, Great Film, Henry Fonda, Jack Klugman, Jack Warden, John Fielder, Lee J. Cobb, Martin Balsam, Review, Sidney Lumet by 4StarFilmFan. Bookmark the permalink.